2013 saw the successful completion of another list of "10 Classics," movies I wanted to be sure to finally see for the first time last year. 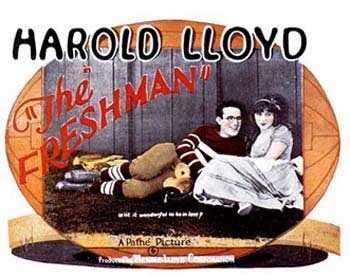 Thanks to the inspiration of my 10 Classics list, I tried a couple of silent films -- which hooked me on the amazing Harold Lloyd -- a foreign film, a classic Western, a gangster pre-Code, a Disney film, a horror movie, a multi-Oscar winner from John Ford, and highly regarded dramas directed by Max Ophuls and Vincente Minnelli. All of these films enriched last year's viewing, and in addition to meeting Harold Lloyd in SAFETY LAST! (1923) I'm especially glad I finally watched HOW GREEN WAS MY VALLEY (1941), a deeply moving and impressive viewing experience. Links for the reviews of all 10 of last year's films can be found here, and there are also links for previous lists and reviews at the end of this post. It's time to post this year's list! The films I'm committing to finally see in 2014 include two more silent films, a foreign film, a key pre-Code, a couple of film noir/crime titles, a pair of Westerns, and a romantic drama, along with Joel McCrea's favorite film of all he made, STARS IN MY CROWN. Given my admiration for McCrea both on and off screen, it's past time I finally see that one! Previous "10 Classics" lists: 2013, 2012, and 2011 (the 2011 list is at the end of this review of the final film on the list). Update: Raquel of Out of the Past has a list this year too! Update: I'm so delighted this idea is catching on! MC has now posted a list at Happy Thoughts, Darling. Update: And here's a great list of 10 Classics to see this year from Lindsay at Lindsay's Movie Musings. Update: Another wonderful list! Here's the movies KC of Classic Movies intends to watch this year. 3:10 To Yuma is on my informal list of notable Westerns that I've never seen but would like to. I crossed one off this year when I finally saw The Magnificent Seven, and the others yet-to-see are My Darling Clementine and maybe The Ox-Bow Incident. Hi Elisabeth! Maybe we'll both watch 3:10 TO YUMA this year? I'd love to compare notes! 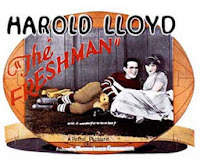 I watched The Freshman last week and I didn't stop laughing one minute! The other one I already saw in this list is Winchester '73, very surprising. I'll keep on watching them with you and reading the reviews! I would suggest The Ox-Box Incident over either version of The 3:10 to Yuma. If you want to see a Elmore Leonard based western I'd go with Hombre. Or Valdez is Coming. As a classicist I would also recommend something based on the works of Zane Grey, he did more to establish the tropes of The Western than any other writer. Laura, a great list to be sure. I envy you seeing Stars In My Crown for the first time. That film was at the top of my favorite-new-to-me movies of 2013 and I'm recommending it to all my friends. Delmer Daves' 3:10 To Yuma is widely considered as one of his best, as I'm sure you know. 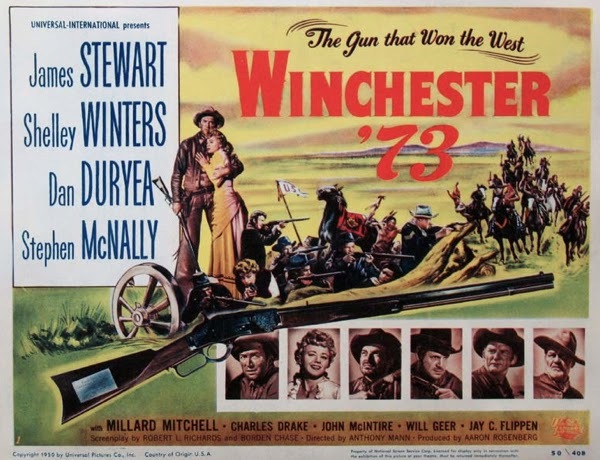 But any of his other 50's "lesser" westerns like Drum Beat or The Last Wagon are almost just as good and would be excellent follow-ups to Yuma. If you haven't seen them yet that is. Oh, and that haunting theme song to Yuma by Frankie Laine is just perfect too. Looking forward to your reviews on all these films! "Now Voyager" is one of my very favorites. I hope you like it, too. Can't wait to find out! This is a great idea and a fantastic list this year, so many great films. One (I won't spoil but) I hate it, lol. Will be interested to see what you think of it. But I would certainly be interested in blogging along, because many I want to re-watch! Actually Owen Wister established the classical western story arc(s) in The Virginian. Never seen Stars in my Crown, but I'm fan of the others. Have fun! 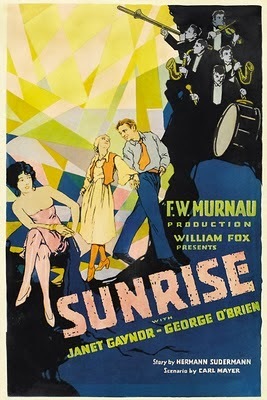 Sunrise (1927) is one of the most beautiful films ever made. I think you will be glad that you gave this silent film a chance. Good list, Laura. Thank you all so much for your wonderful, supportive comments today! I'd love to receive additional comments on any of these films, either here or as I write about seeing them. Le, that's great to hear that you found THE FRESHMAN so enjoyable! I'm so happy that you've been able to enjoy watching my "10 Classics" along with me -- I love that the internet makes the world so small we can even share this from different countries! 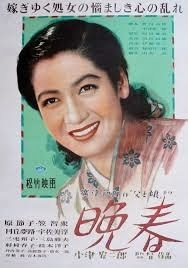 Redcon1, that is quite an endorsement hearing that STARS IN MY CROWN was your favorite new-to-me film for last year! 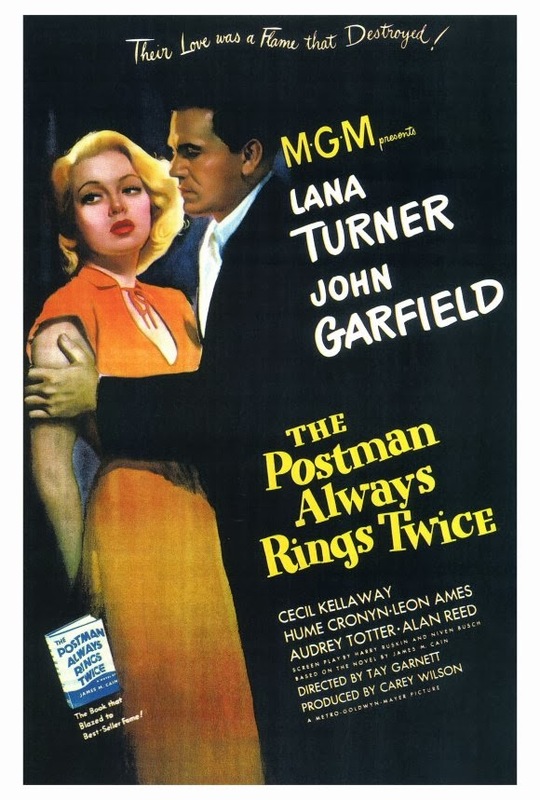 I have a feeling I'm going to love it, given how much I love Joel McCrea. I did really like Delmer Daves' THE LAST WAGON but haven't seen DRUM BEAT so I'll keep that one in mind too. Thanks! Barrylane, I loved the book THE VIRGINIAN. The TV series, which I met in reruns, gave me the impetus to try the book as a teen and I was surprised that things went a little differently for Trampas in the book! Mythical Monkey, if you happen to check out STARS IN MY CROWN this year please let me know! Thanks for your feedback on the other titles. Ken, I appreciate your feedback as well. I'm such a fan of George O'Brien's "B" Westerns that I have to see him in a silent film which is so highly regarded. Thanks to each and every one of you for taking the time to look over my list and share your thoughts! Some gems on that list Laura and I hope you get enjoyment from them. I'd be amazed if you don't find some pleasure in 3:10 to Yuma, it's Daves' best movie and one of the finest westerns ever - tense, moving, uplifting all rolled together. These are good picks! Stars in My Crown is quite the hidden treasure. I love Juano Hernandez in that one. This is such a good idea. My viewing has been all over the place lately. I think a list like this would help me to focus better on things I really want to see. Thanks, GrandGirl, I'm looking forward to those titles as I especially love Westerns and film noir. KC, it's interesting, pretty much everyone who has seen STARS IN MY CROWN feels that it deserves classic status alongside much better-known films; it's wonderful to read so many glowing things about it. I really look forward to seeing it. KC, this is the fourth year I've made a list of 10 films to see for the first time in the coming year, and it's really been a valuable experience. Even with all the years I've been watching movies, it's surprising sometimes how many very well-known or highly regarded films I've yet to see. Like you, my viewing tends to be all over the place (grin), and I've found having this list to be a good experience, making sure that I finally cross a few more classics off my "seen" list. Even the experience of making the list is valuable because it causes me to consider movies I need and want to see, so it's led me to see other films even if they didn't make the "official" list! It's not that many films for a single year, but now I can look back at 30 significant films I've finally gotten to know over the last three years, filling in some important gaps in my viewing. Even those films I haven't liked that much enriched my viewing and provided a lot of food for thought as I analyzed why they didn't work for me, and they have given me context for other viewing. I've also sometimes used the list to try to stretch myself out of my "comfort zone" a bit. If you or anyone else publishes a similar list this year or another year, I'd love to read it and also share a link to it here! I think I'm going to do a list this year. It sounds like so much fun. Got to get on top of my book reviews first though! I'd love to see your list, KC! Very nice list Laura. I'm surprised you haven't seen Now, Voyager but at the same time glad you plan to see it soon. Its one of my favorite films. I tried watching it on the big screen once and these two ladies were laughing at it. I had to walk out so they wouldn't ruin the experience for me. Its a delightful movie. I'm really curious what your thoughts are on Baby Face and Sunrise, those are two favorites of mine as well. I'm working on my list and I hope to have it up soon. Thank you, Raquel! A couple of my kids were very insistent I finally see NOW, VOYAGER, and I'm looking forward to it! :) I enjoyed hearing which titles on my list have special meaning for you. Very much looking forward to reading your own list!! Hi again, Laura. I've decided to steal your idea and create my own list of 10 to see in 2014. Seems like a fun way to expand my movie horizons and also motivate myself to update my blog at least 10 times this year. :) Thanks for the inspiration! I've been meaning to come over and comment on your list for a while. Great stuff and varied choices on here! I actually just saw Now, Voyager for the first time yesterday, and can't wait to hear what you think. Same with Kiss Me Deadly :) Glad we'll get to experience Winchester '73 in a few weeks on the big screen as well. I'd also throw my hat in the ring for The Ox-Bow Incident for another year's list. Tough one to take, but one of my favorite films. Here's to a great 2014! Thanks, Lindsay, I appreciate you leaving a comment! What fun you just saw NOW, VOYAGER, we'll be able to compare notes soon. 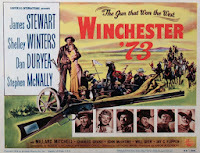 :) Really looking forward to seeing WINCHESTER '73 with you on the big screen at UCLA!! !